Even when writing nonfiction, award-winning fantasy author Neil Gaiman never fails. In this first collection, Gaiman includes a variety of essays, speeches, articles, and introductions. His topics include books, fairy tales, music, authors (living and dead), and writing, just to name a few. The pieces towards the beginning, on the importance of books and libraries, is likely to warm the heart of any reader, and his thoughts on any subject are always precise, intelligent, and beautifully worded. Gaiman manages to put into words the things we’ve all been feeling, but never quite knew how to speak about. While his introductions to other books might feel incomplete without the books themselves, they were still interesting to read because Gaiman talks about how each influenced his own life or books he’s written that I’ve loved. Additionally, some of these introductions are written for books by authors he has known and it was fascinating to read about these authors I’ve always seen on book spines, but now have a more personal understanding of through Gaiman’s eyes. 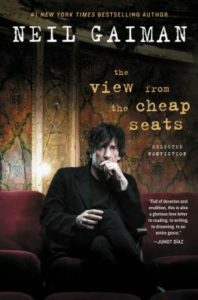 Gaiman himself reads the audiobook of The View from the Cheap Seats, and his soothing voice will make any drive more relaxing and comfortable. I personally spent 8 hours on a road trip listening to this audiobook and not once wanted to turn it off, even for a moment.